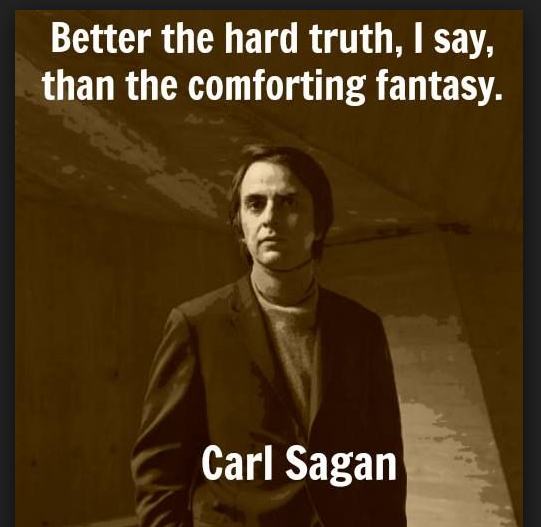 Ahh, if only we could get off this planet, get away from this authoritarian Trumpian Old World that divides those who are purple from those who are orange. Many of you were bucked up this week by the NASA announcement of seven new Earth-like exoplanets, a mere forty light-years away in our own cosmic back yard. (See next story.) Personally, I was buoyed by the news of a slew of newly-discovered, possibly inhabitable “nearby” planets orbiting the tiny Trappist-1 star a cosmically stone’s throw away. Not only that, the revelation shows the potential for such systems to exist close enough to get to, someday, sooner than later! It’s always a shot in the arm to hear about these kinds of new discoveries, to dream we might escape the exosphere and inhabit a new world in time to save ourselves from the steamroller of fascism and corporate planet killing. In the meantime, however, to blithely believe it’s not as bad as all that is infantile. This new regime will stop at nothing to fill Donald J Trump and his associated fiends’ pockets. 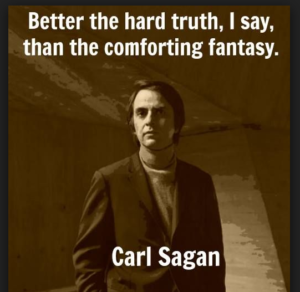 And to accomplish this includes hatred of all things scientific and truthful (i.e. keeping you and I stupid and not focusing on the real puppetmasters), even when it comes from Trump’s own hand-picked staff at the Department of Homeland Security, for example, who, standing up to his boss, just reported there have been ZERO terror attacks on American soil committed by the seven eastern countries he wants to bar from entering the U.S. This kind of nutballery is why former Attorney General of Oklahoma Scott Pruitt is such a perfect fit. 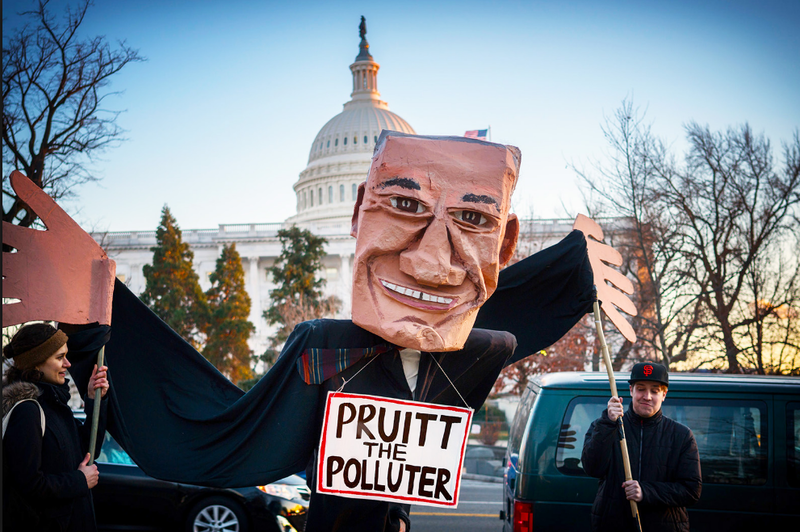 as far as the Trump regime figures, to head the Environmental Protection Agency – which Pruitt sued 14 times – and who served as a highly paid lobbyist for the oil and gas industry while he was getting gets paid to protect Oklahoma. That’s not just an impropriety. It’s illegal. 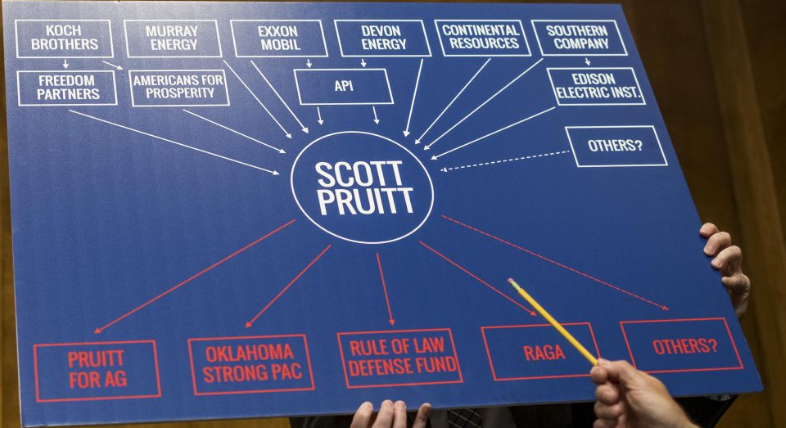 In addition, during his tenure as Oklahoma’s AG, Pruitt’s favorite hobby was “cutting and pasting” the industry’s lengthy environmental regulation complaints and objections onto his own Attorney General letterhead, and submitting them as legal arguments written by him to higher courts so that the energy corporations would get their way. And it worked. By the way, that’s also illegal! 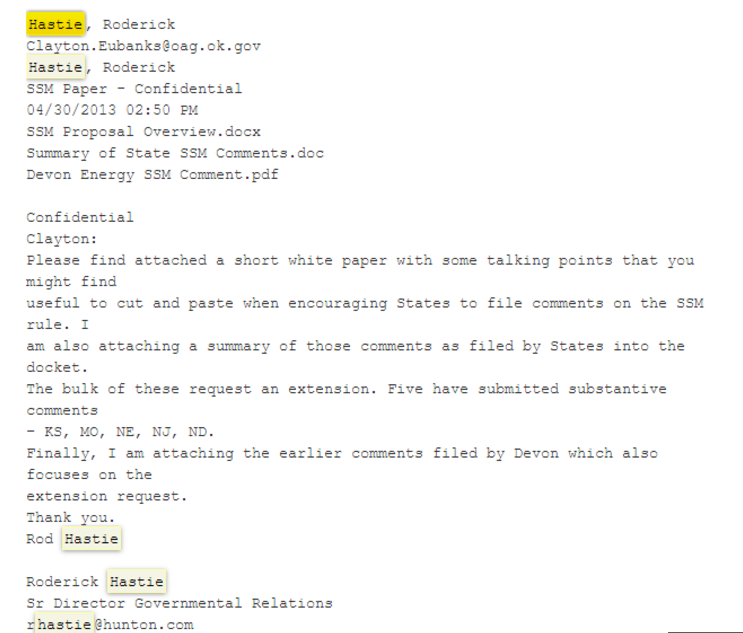 And when investigative reporters asked him for the years of correspondence between his office and the oil/gas industries, and even filed Freedom of Information Acts to get those “public records,” Pruitt refused to fulfill those FOIAs for two years. Oh yeah, that’s illegal too!! 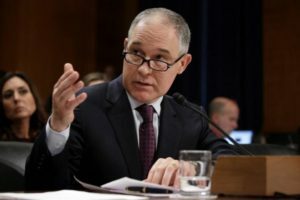 Finally, a judge ordered Pruitt recently to release all those letters with a deadline of last Tuesday which GOP Senators were fully aware of as they rushed to confirm him as EPA head before the letters could be published. And we pay these blatant idiots to watch out for us?? Seems confounding that they’re willing to roll the dice knowing this gu y would most likely become a public pariah once the emails are released. Do they know something we don’t, or is the confirmation bottom line really all that matters? 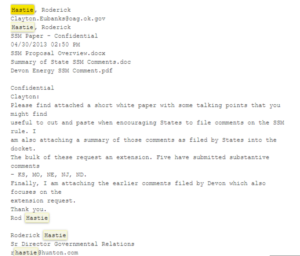 Sure enough, so far 7,000 pages of the released emails reveal that Pruitt was getting paid to lie to the state and the courts about the effects that the fossil fuel industry has on all lives and the environment. 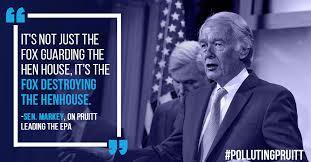 For example, in 2010 alone Pruitt, while Attorney General for Oklahoma, took in $40,000 in contributions from the poultry industry for filing briefs for them when they were found poisoning the water in a nearby state, with, yes, chicken poop, and sued for it. It is known as, literally, “the Chickenshit Case” and it’s ongoing. 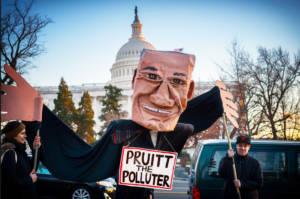 And what Pruitt did then was – surprise! – illegal, too! As of this writing, you can hear a pin drop from the silence as the press shrugs all this off and mutters “no big deal.” Of course we all know there will be no consequences for these egregious breaches in public trust. No one is going to jail. No one is even going to get fined. Trump, or perhaps we should say President Steve Bannon, has made sure that the Justice Department is now headed by infamous Trump campaign cheerleader, environment-hating voter suppressor and racist extraordinaire Jeff Sessions. Meanwhile, as venal “public servants” like Pruitt, and anti-science shills like Texas Rep. Lamar Smith (R-Hades) of the House Committee on Science, Space and Technology do their best to roll back any attempt to understand and fix the wrongs we have committed against our planet, and get paid for it while picking up the paycheck we give them, we are comforted that a few scientists are getting pissed off enough to actually jump into the public pool of political service. JPL scientist Tracie Van Houten is one of them, and she is willing to give up her career in inventing innovative space missions for representing the 34th Congressional District of California in the U.S. House. The election is in April. 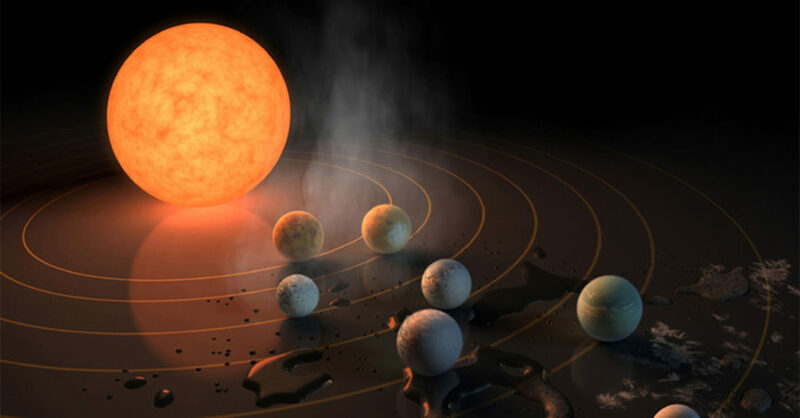 On Thursday NASA finally held a much-ballyhooed presser about the new Trappist-1 planetary system it discovered – a heptad of worlds orbiting a star located a mere forty light-years away from us. 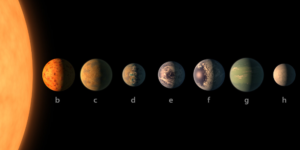 What makes this a big deal is that at least six of these planets are fairly Earth-sized, and their orbits reside in what is deemed the habitable zone for life around their star – not too hot and not too cold. Even more significant, since Trappist-1 is one of an astronomically abundant (and longest lasting) category of puny gas balls, the probability of planets like our own existing in the cosmos has exploded exponentially. And when the super-duper James Webb Telescope launches in 2018, NASA said, the agency will be able to combine its findings with the current data from the Kepler, Hubble and Spitzer scopes currently trained on the system since its discovery three weeks ago. “With much greater sensitivity, Webb will be able to detect the chemical fingerprints of water, methane, oxygen, ozone, and other components of a planet’s atmosphere,” said NASA wags. 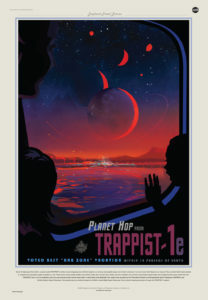 “Webb also will analyze planets’ temperatures and surface pressures – key factors in assessing their habitability.” According to NASA, since Trappist-1 is an M class red dwarf, its planets are huddled close together and could be tidally locked, which means only one side is perpetually facing the star, as our moon is unto the Earth. We’ll know more when and if the Webb gets kicking. Also just in! 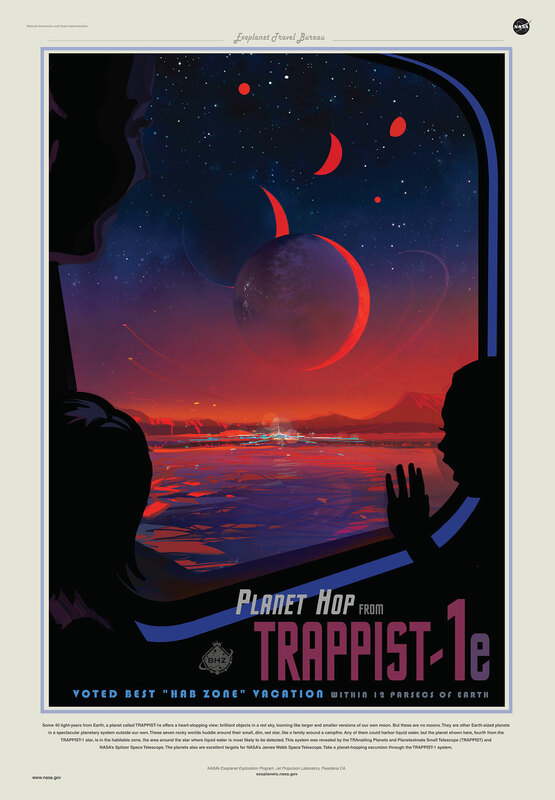 NASA has added a Trappist-1 planetary system “tourist” poster to its growing collection of artwork intended to garner excitement about space travel and exploration. Collect them all! 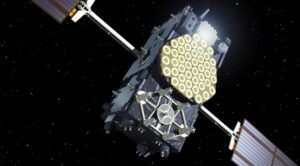 The recent “Brexit” move that caught the world by surprise (in addition to many Uk’ers that voted for it) may also end up pulling England out of its current agreements with the European Space Agency. One of those deals provided Great Britain use of the Galileo navigational satellite system operated for government use only, which, you know, allows lubberwortish members of Parliament to get from the districts they represent to their highchairs n the House of Parliament. Weeks before the xenophobic Brexit vote came down, members of the European Union – as well as some of the more saner members of Parliament – warned their peers that having England fly solo economically could mean a damaging loss of a lot of EU goodies. Britain will likely have to go through a cumbersome renegotiation process with the EU to re-establish their access to Galileo. Say “Cheerio!” to your GPS nav systems, m’ lords! 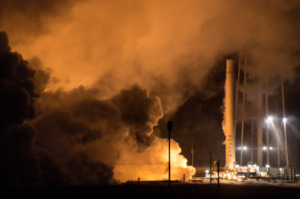 SpaceX’s Dragon uncrewed cargo capsule carting 5,500 pounds of supplies successfully delivered its loot the International Space Station last Thursday after an abortive attempt the previous day. 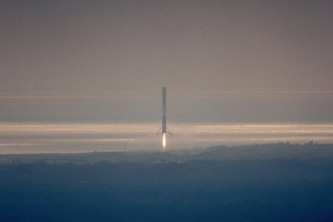 In a series of firsts a few days earlier, the Elon Musk-led commercial space enterprise ended its Falcon-9 launch hiatus since the fiery rocket explosion last September with a successful blast-off of the Dragon capsule from the famed Apollo-era pad 39A, and the subsequent safe landing of the first-stage booster at nearby Cape Canaveral Air Force Station. After purchasing all the sterling-plated Rolls Royces in the showroom, what’s an Arab sheikh going to do? 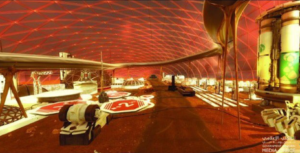 Plan a city on Mars, of course! 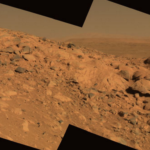 At least that’s what the United Arab Emirates (UAE) prime minister Sheikh Mohammed bin Rashid Al Maktoum has announced in a series of Trump-like tweets recently as he unveiled that country’s plans to build a “mini-city” on the Red Planet by 2117. “‘Mars 2117’ is a seed we are sowing today to reap the fruit of new generations led by a passion for science and advancing human knowledge,” Sheikh Mohammed tweeted, referring to the multi- generational nature of the project, given the tiny country’s current barebones space program, To help fuel the intellectual capital required for such an endeavor, the Mars 2117 project “includes a major space sciences focus in our universities [to build] a space pioneering passion among our young people,” Sheikh Mohammed noted. The UAE has already fixed its sights on the cosmos with the announcement in 2015 of its “Hope” robotic mission that will arrive at the Red Planet in 2021. 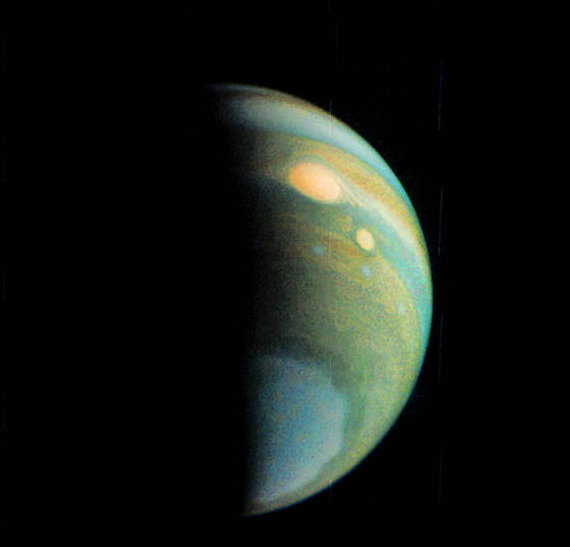 NASA announced last week that because of a technical glitch in an engine valve of its Juno spacecraft, the agency has decided to keep the Jupiter-orbiting craft on its 53-day path around the gas giant for the remainder of this mission instead of the original plan to plop the probe in a shorter (but not closer) 14-day orbit. 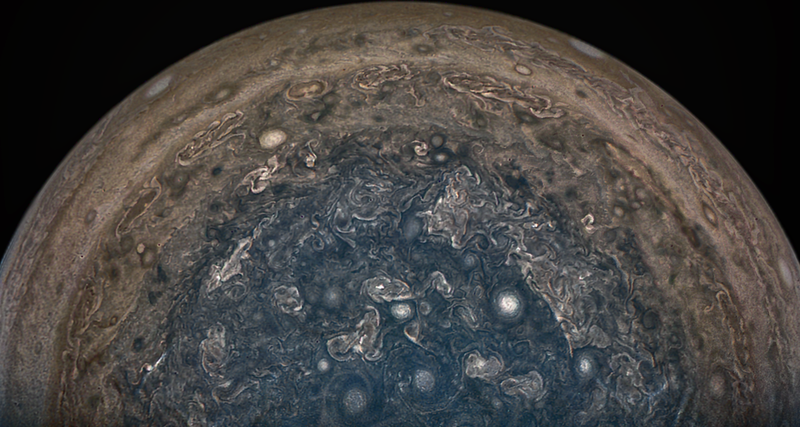 “Juno is healthy, its science instruments are fully operational, and the data and images we’ve received are nothing short of amazing,” said Thomas Zurbuchen, associate administrator for NASA’s Science Mission Directorate in Washington. “The decision to forego the burn is the right thing to do – preserving a valuable asset so that Juno can continue its exciting journey of discovery.” NASA insists that the longer orbital period will not compromise the mission’s science objectives; rather it expects the longer travel path will open up new opportunities to study Jovian space dominated by the planet’s super-strong magnetic field. Juno’s next close flyby of Jupiter will be March 27 where it will skim about 2,600 miles above the planet’s cloud tops. 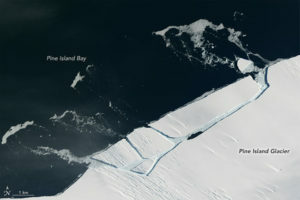 Yet another chunk of ice, this one a mile long, calved off the ever-changing Pine Island Glacier of Antarctica again, and NASA sats caught it. No, we haven’t heard a peep from the Bannon Administration – “Nothing to see here, folks. Move along.” In these recent years of glacier meltdown and Earth warming, scientists have warned again and again that the Pine Island area has become increasingly unstable, losing bergs the size of cities into the ocean, and frequently. The last major event happened in July 2015, when a 225-square-mile iceberg calved from the glacier and disappeared into the sea. Hopefully, these bergs will do their part in raising sea levels especially around Trump’s Mar-a-Lago restricted club in Florida. 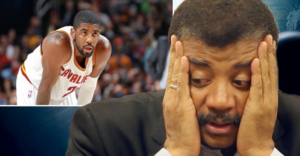 Tyson then proposed we launch Irving and fellow flat Earthers into space, and only let them come back home once they all admit they are wrong (Editor’s Note: and our planet really is the same shape as a basketball). News Alert! NASA will be holding a major press conference this Wednesday, February 22, at 1 pm eastern time regarding a “discovery beyond our solar system,” including new revelations on exoplanets orbiting stars other than our Sun. The event will air live on NASA Television and the agency’s website; in addition, media and the public also may ask questions during the briefing on Twitter using the hashtag #askNASA. Don’t look now, but the stars are aligning to bring a full stop to environmental safeguards in the US, including a not-too-subtle war to effectively abolish the EPA. 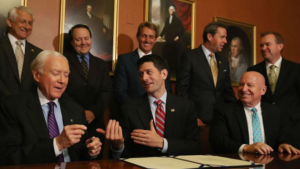 On the front lines are DC Republican lawgivers, who – bolstered by der Trumpinfest’s War on Science and anti-pollution securities – are busy fanning the flames of ecological armageddon by putting the 1996 Congressional Review Act on autopilot as they systematically eliminate recently-finalized Obama-era protections, allowing carbon-based energy corporations to dump their coal ash and oily crap into any and all U.S. waterways . 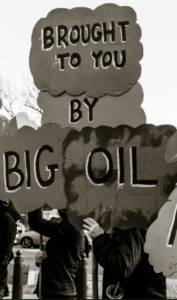 And as we have reported here for months, completing the deed is Trump, who has done anything and everything in his power – and NOT in his power – to protect his financial interests in filthy energy, including holdings in Phillips 66 that is – Suprise! 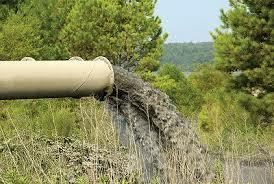 – a joint partner in the eco-dirty bomb known as the Dakota Access pipeline. What a guy! Apparently Smith longs for a simpler time when the sound of the subpoena “slap” and the “sacred” footsteps of the late Sen. Joe McCarthy echoed menacingly throughout the halls of Capital Hill. So, you may ask, why do we continue to report on this? 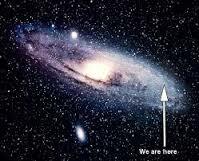 Well, we love this Universe, albeit one of untold many. 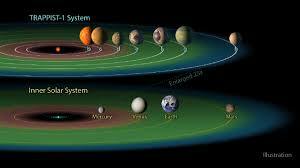 We report on this solar system, and the Earth is in this solar system, it’s OUR one tiny planet in this cosmos, our only home so far, thereby, it is part of this vast Universe. 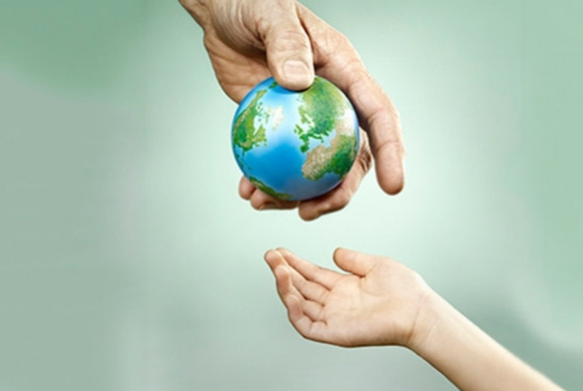 And, frighteningly, all signs point to an Ego-Monster child who is dialing the clock back on environmental stewardship and lead-footing the fossil fuel juggernaut until it lies scattered in charred pieces across a silent planet. We do not believe Trump has a blood-lust to kill this globe, per se. But anything that gets in the way of him and his gilded silverware, well, that’s WAR, and it’s going to suffer. Galactic Sandbox has given you many stories of how this new Imperialistic Regime will do anything for votes or for money, especially if it means appealing to jobless coal miners who will never dig through the earth again anyway due to technological advances in automation. Trump and his cabal of yes-men will lie until their death to everyone, to Jesus himself, to protect his bottom tax-free line. Again, I am compelled to end this commentary on a note of realistic hope. 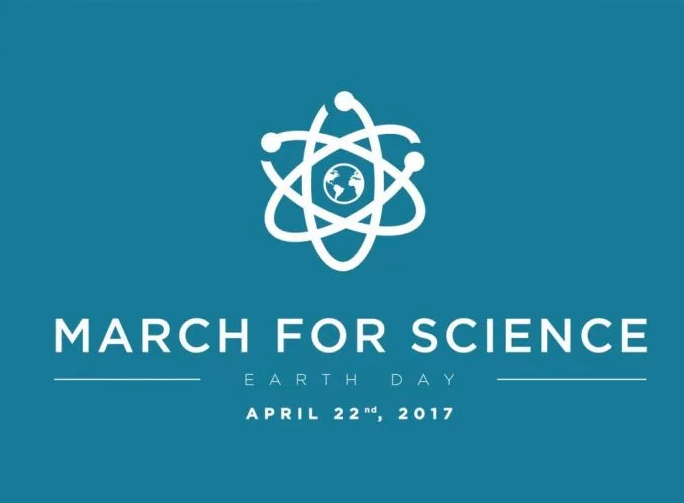 Right now an army of beautiful nerds is working hard to preserve the knowledge of our scientists, both in federal and private sectors. Flash news! Wow, BIG goings on! 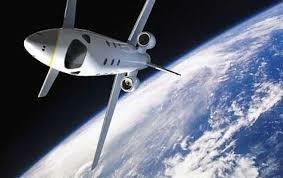 Russia is now selling tickets to ANYONE who wants to get into outer space for a mere quarter of a million bucks! Oh, wait – like the baritone strains of the wildly popular folk tune Kalinka-Malinka, I’m pretty sure I’ve heard this diddy before. In fact, if I had a nickle for every time my dear editor and colleague Agnett and I had to report on this pipe dream story, well, we would be richer than that moron who is currently Cheeto-in-Chief. You see, Bonwitt and I have lived through literally decades of this hullabaloo regarding sending tourists into space, particularly those featuring a Russian-language countdown. In fact, we were reporting on space “tourism” in 1989 and before that…and most of these fly-by-night entrepreneurs were con artists. But for those of you who are still dreaming, here it is: Russia’s Czar, Puto, (er I mean, Putin), wants to compete with the likes of Richard Branson of Virgin Galactic and Musk of Space X by offering “rocket rides” to the exosphere on their crappy outdated Soyuz vehicle, and they will charge you a mere $250,000 for the privilege. The problem is that Branson and Musk are actually GOING to do just that, and they are not going to rip anyone off. What a concept. Of course, one must remember that this FREE PR story was printed in none other than the original fake news rag called the Daily Mail. Putrid. 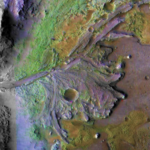 Like Paris of Troy, NASA will now have to decide which of the three landing site finalists for the agency’s 2020 Mars mission is the most attractive for studying life on the Red Planet. 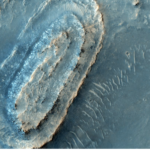 Last week, a panel 240 scientists voted on the following Martian locations that will be the subject of further scrutiny: Northeast Syrtis (a very ancient Martian region), Jezero crater, (once home to an ancient lake), and Columbia Hills (an area once explored by NASA’s Sprit rover, and potentially home to an ancient hot spring.) 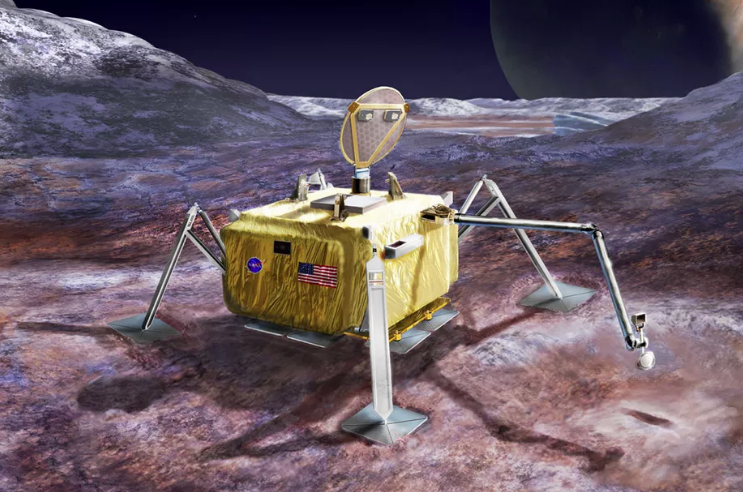 The Mars 2020 mission is slated for launch in July 2020, and among various experiments, NASA plans to conduct geological assessments of its landing site on Mars, determine the habitability of the environment, search for signs of ancient Martian life, and assess natural resources and hazards for future human explorers. 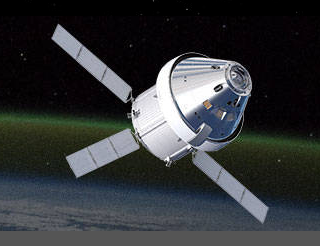 It will also prepare a collection of samples for possible return to Earth by a future mission. 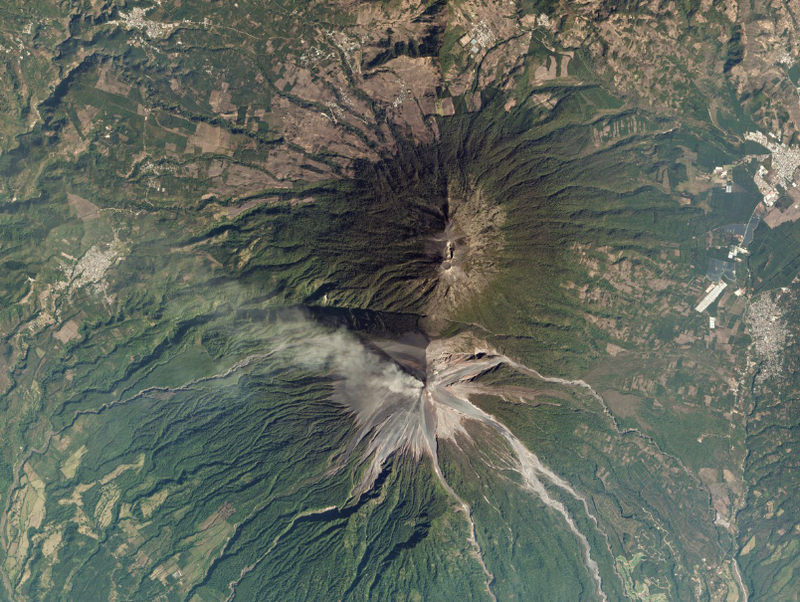 Guatemala’s Volcán de Fuego in a Dove snapshot taken in January. India’s Space Research Organization torched a hole in the record books last week with the launch of its Polar Satellite Launch Vehicle (PSLV) that wisked 3,000 pounds of payload into orbit including three Indian satellites and 101 nanosats from five other countries – Count ’em, that’s 104. The bulk of the rocket cargo was a flock of tiny 88 Dove Satellites from the U.S.-based firm named Planet. In fact, not only is the US company part of the most numerous single satellite launch in history, it is now the proud owner of the largest private sat network with 149 tiny Earth-imaging eyes-in-the-skies. 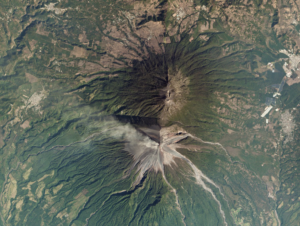 “With these satellites in orbit, Planet will reach its Mission 1: the ability to image all of Earth’s landmass every day,” the company said in a statement. In addition to the 1,500-pound Cartosat 2D mapping satellite, rounding out the lengthy list of spacecraft launched by the Indian booster were eight LEMUR satellites built by American company Spire Global that will be used to monitor ship traffic and offer meteorology data, and various nanosat missions carrying student projects and science experiments. 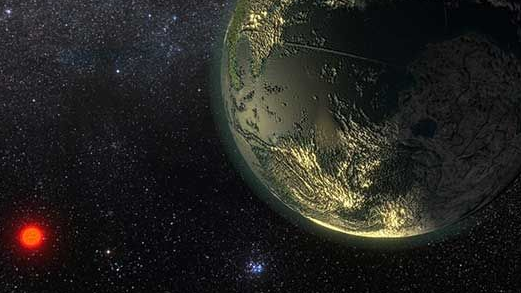 Newly-discovered “super Earth” Gliese 411b is part of a slew of new exoplanets found near our solar system. The known planetary population of our neck of the Milky Way has popped considerably thanks to an international team of astronomers that has discovered 60 new exoplanets – including a hot, rocky “super Earth” – that are whirling around stars close to our solar system. According to the University of Hertfordshire in England, the intrepid team found additional evidence of another 54 worlds, ringing up the cosmic discovery total to an astounding 114. The results, based on 20-year observations using the Keck-I telescope in Hawaii, shows that virtually all the nearest stars to our Sun have offspring, including those close in nature to our own. 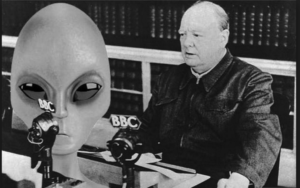 In our never-ending quest for our next Tin Foil Hatter of the Year, we have stumbled across a startling dark horse — none other than the late Sir Winston Churchill! According to a recently-unearthed manuscript titled “Are We Alone in the Universe?,” the British Bulldog was seriously musing the potential of life elsewhere in the cosmos, apparently over two decades before famed astrophysicist Frank Drake forwarded his theory about the number of advanced civilizations outside our own. While it may seem unfair to toss England’s beloved wartime savior with the likes of climate change-denier extraordinaire Lamar Smith and the guy who “discovers” statues of Elvis Presley on Mars, however it does seem odd that as Great Britain was preparing to go to war with Germany in 1939, thoughts of extraterrestrials was one of the top things on his checklist. Also, years later when he was prime minister, Churchill ordered a suspected UFO sighting by the Royal Air Force to be kept under wraps for 50 years to avoid a “mass panic.” For more fun facts about this fascination of Churchill’s take a look at this New York Times article, and you can decide whether Sir Winston looks good in a foil Homburg. It’s official. 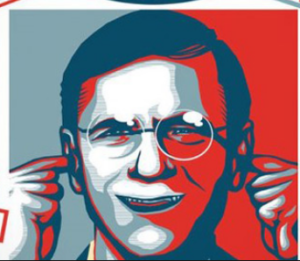 That HIGHlarious party animal we’ve all come to know and love, Texas Congressman Lamar Smith (R-Mad Max Apocalyptic Wasteland), has clinically lost his mind. 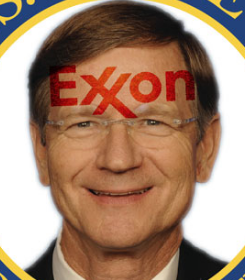 Medics have made a diagnosis: it seems Smith’s brain got pickled in fossil fuel power. Cursory medical forecasts of the maroon’s mind are not good. The larded muscle between his ears is atrophied stiff with oleaginous lobbyist money. (Since 1989, Smith has received $697,747 in “donations” from the oil and gas industry.) Utterly putrid. 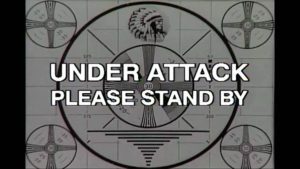 Smith – DC’s unofficial science-slayer – and, yes, head of the House Science, Space and Technology Committee, held a hearing on the hill Feb. 7 called – hold onto yer hat – “Make the EPA Great Again.” And if that doesn’t make your skin crawl, we suggest you get to the nearest emergency room ASAP. 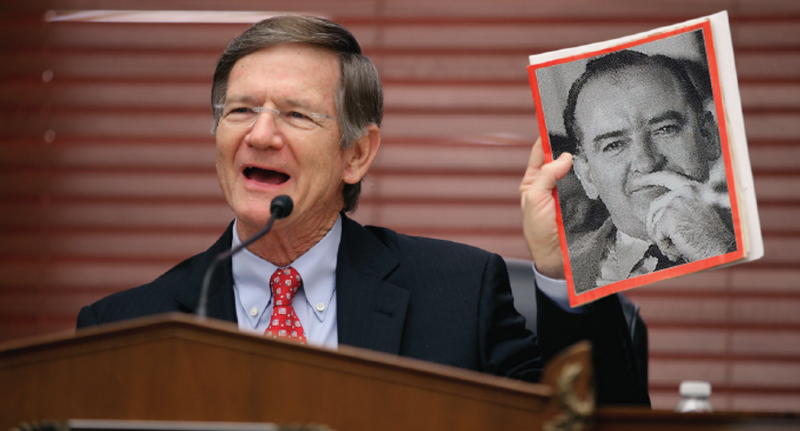 We know all too well about Smith’s unconstitutional crusade against federal scientists, especially those who study climate change. During the Obama years, Smith pushed the envelope hard in his persecution of climatologists in federal agencies, particularly those at the National Oceanic and Atmospheric Administration (NOAA). Enraged by NOAA’s 2015 Karl Report (which details how the oceans’ temperatures have risen at an alarming rate) oil companies – er, I mean Lamar – unsuccessfully subpoenaed the agency’s emails in a pathetically vicious attempt to “catch them” at faking global warming numbers. NOAA’s Administrator Kathryn Sullivan (first American woman to walk in space, and one of the astronauts to deploy the Hubble Space Telescope) told Lamar to stuff it when she handed him emails from the agency’s office support workers, but none from the agency’s scientists themselves. (See Galactic Sandbox November 11, 2015, “Hot Under the Collar”). He also unsuccessfully tried to introduce a bill to essentially “neutralize” the EPA’s Science Advisory Board when he found out that panel was doing research on fracking. While Smith’s McCarthy-like fury against NOAA has been widely publicized, it seems NO scientist is immune from Smith’s hysterical witch-hunting. 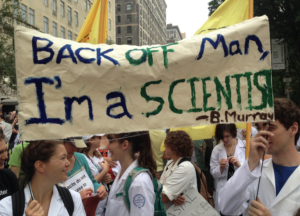 The subpoena-happy harpy has issued many more on many other scientific groups – some that are simply non-profit researchers – like 350.org and the much esteemed Union of Concerned Scientists. 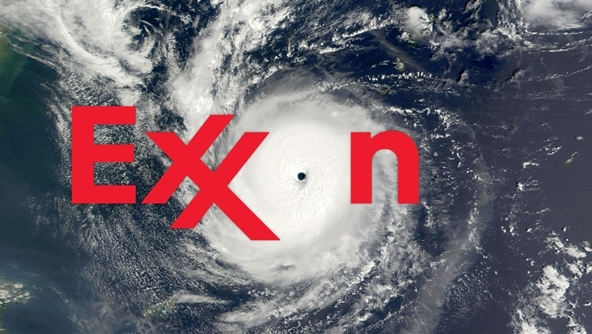 And of course he rushed to the defense of Exxon Mobile when it had been revealed the company knew for years that fossil fuels contribute greatly to global warming, and that they absurdly tried to cover it up. Lamar even slapped subpoenas on both the New York and Massachusetts Attorney Generals for attempting to investigate Exxon’s activities. 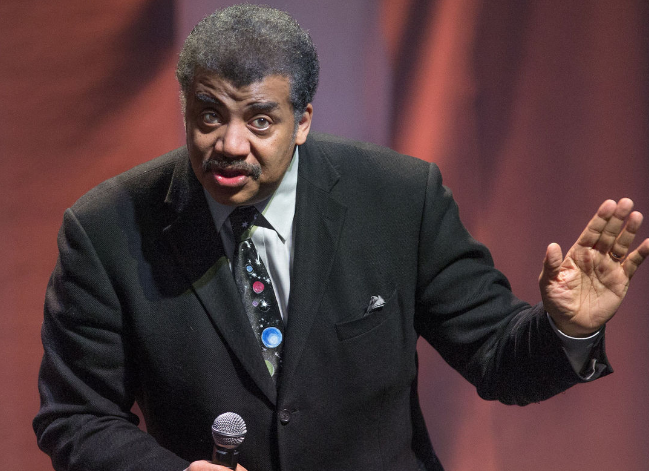 (See Galactic Sandbox October 15, 2015, “Frankly, Lamar, We Do Give a Damn”) Ever the tireless crusader, Lamar is also still trying to slash the coffers of the National Science Foundation. Lamar’s insane windmill-waving – which we always knew could not get too far as long as Obama was holding a veto pen – is now no longer amusing. In fact, he is exactly the kind of shill der TrumpenFuhrer could normally only dream of. 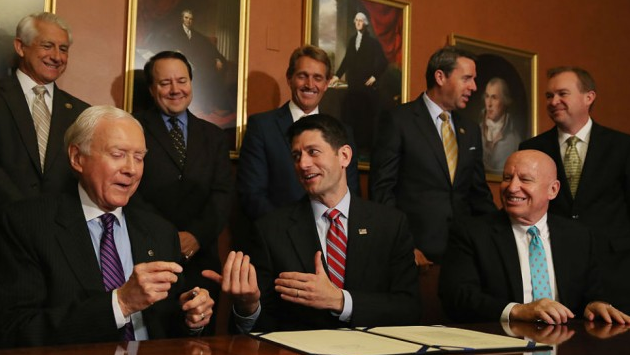 House Republicans partying like its 1876. And what of the “Make the EPA Great Again” hearing? Of course, it was beyond putridity, and Smith used it as a one-man band to excoriate the EPA and the “idea” of climate change in general. But he also used this “hearing” (which he stacked with oil/gas industry lobbyists the way Trump stacks every public appearance with clapping howling “fans”) to go high-octane bonkers over a “story” (and we mean “fairy tale”) published last week in the British tabloid called The Daily Mail, which supposedly revealed a “whistle-blower” disputing the numbers in NOAA’s 2015 Karl Report. 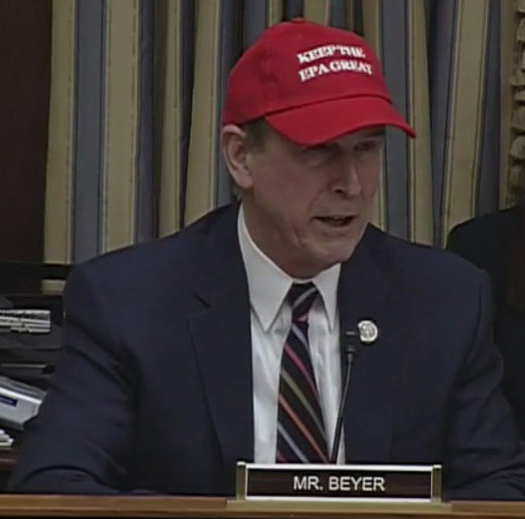 Congressman Don Beyer (D-VA) pushes back on Lamar Smith’s farcical hearing last week by donning “Keep the EPA Great” cap. But poor power-mad Lamar made the mistake of inviting the head of the American Association for the Advancement of Science (AAAS), former Congressman Rush Holt (D-New Jersey), to the hearing, and after a windy indictment of NOAA, demanded that the AAAS denounce and redact the NOAA study. But Holt, to dumb-screwed Lamar’s amazement, gave him a big fat NO for an answer. 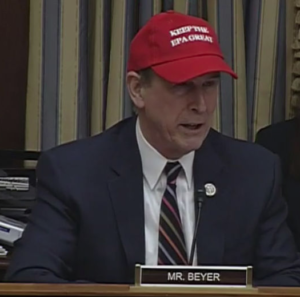 Holt instead argued the merits of NOAA’s numbers right there at the “Make the EPA Great Again” hearing. One can imagine the coal-black smoke coming out of Smith’s ears when that happened. In the end Lamar’s self-righteous indignation did nothing but bring into sharper focus how delusionally disingenuous he is. Within days the story was discredited over and over again – even by the so-called retired NOAA “whistle-blower”! – and by independent researchers from the University of California Berkeley and other unimpeachable science sources. All confirmed the NOAA rising climate numbers. Meanwhile, outside the hearing, Holt told reporters, “This is an internal dispute about a detail of how you might measure land temperatures or water temperatures. 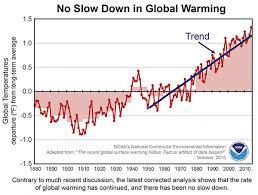 It is not a departure from the general understanding of what’s happening to temperatures in our globe.” Holt added, “If you want to be on the right side of any issue, you would do well to go with the evidence ― the best understanding at the time of what it’s going to be. Not some fringe idea.” Touché, Mr. Holt! 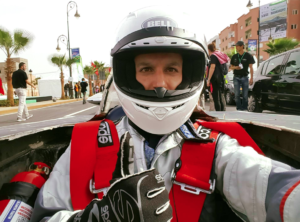 JPL scientist Sidd Bikkannavar racing his solar-powered car. Note suspicious fire extinguisher on his right. 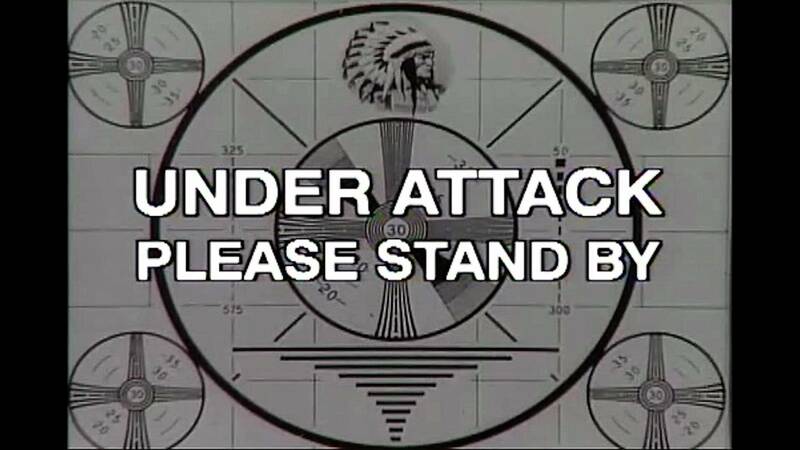 Sorry for the absence. On my way home to the US last weekend, I was detained by Homeland Security and held with others who were stranded under the Muslim ban. CBP officers seized my phone and wouldn’t release me until I gave my access PIN for them to copy the data. I initially refused, since it’s a JPL-issued phone (Jet Propulsion Lab property) and I must protect access. Just to be clear – I’m a US-born citizen and NASA engineer, traveling with a valid US passport. Once they took both my phone and the access PIN, they returned me to the holding area with the cots and other sleeping detainees until they finished copying my data. I’m back home, and JPL has been running forensics on the phone to determine what CBP/Homeland Security might have taken, or whether they installed anything on the device. 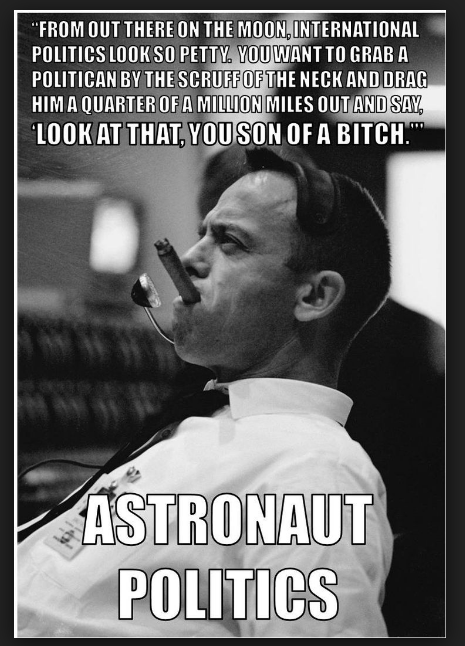 I’ve also been working with JPL legal counsel. I removed my Facebook page until I was sure this account wasn’t also compromised by the intrusion into my phone and connected apps. I hope no one was worried. JPL issued me a new phone and new phone number, which I’ll give out soon. Attorneys for the plaintiffs in a landmark federal climate change lawsuit last week named Donald Trump as a defendant as plans ramp up to begin the trial this fall. Originally filed in 2015 against the Obama administration by a group of children, young adults, and environmentalists, the lawsuit claims US government officials failed to protect the plaintiffs from the perils of climate change, despite detailed scientific warnings and research to its dangers. According to Scientific American, one of the plaintiffs’ lawyers said other Trumpian Cabinet members will be listed as defendants, replacing Obama-era leaders in the Energy, Transportation, Commerce, Defense, State, Agriculture and Interior departments who were tagged as offenders in the case. “The policies of the U.S. government that ignore the threat of climate change are only going to get worse under the new presidency, based on Trump’s apparent lack of understanding of climate science and his plans to invest further in the fossil fuel industry,” Kiran Oommen, 20, a plaintiff in the lawsuit, said in a statement last week. The government is expected to appeal the case to get it thrown out, however our litigious leader will have his tiny hands full putting out constitutional as well as personal fires if the first three weeks of his term is any barometer of things to come. 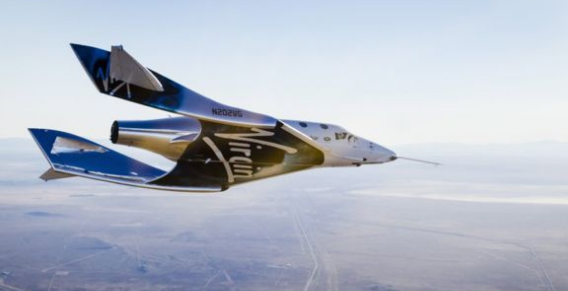 Space tourist contender Virgin Galactic could be one of several commercial space entities operating from Great Britain in the not-so-distant future. The British government is looking toward the heavens for a renewed spark to England’s sloth-like services-based economy, and has leaped forward in a push to build spaceports on its own soil with the announcement of a series of grants totaling 10 million pounds for a commercial consortia formed to launch satellites – and eventually humans – from the United Kingdom. UK ministers also are expected to introduce a Spaceflight Bill later this month to establish the needed regulatory and licensing framework for British-based launch activities that potentially will include traditional vertical rockets and tourist-toting spaceplanes, reports BBC News. “Spaceflight offers the UK the opportunity to build on our strengths in science, research and innovation,” said Science Minister Jo Johnson in announcing the new grants. 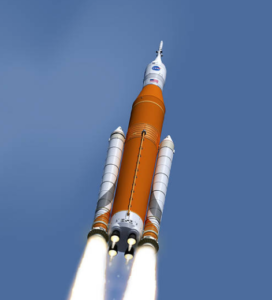 Johnson added that the commercial spaceflight activities could be worth an estimated 25 billion pounds over the next 20 years. Jovian satellite Europa has a subsurface ocean twice the size of all Earth seas. 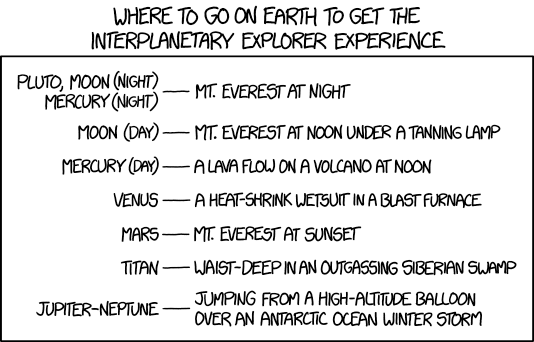 The first out-of-this-world GlobalXplorer outback conducted from 435 miles above Earth will be an expedition in the remote deserts of Peru. 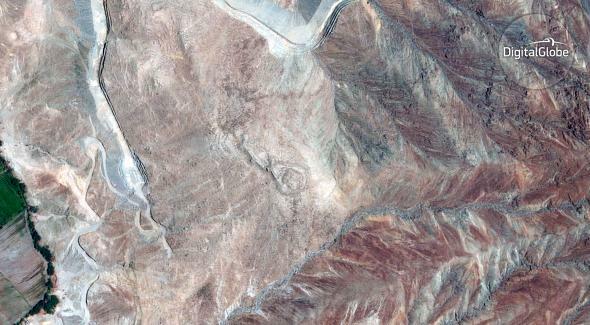 Many of you have seen the fascinating TV show called “What on Earth,” and now you too, can become the next Indiana Jones of space-based archaeology. Sarah Parcak – who pioneered the use of satellite imagery to discover lost cities and buried ruins – is launching a new online tool called GlobalXplorer so that every Tom and Jane can find new wonders on our planet using Earth-spying satellites. “Archaeologists can’t do this on their own,” says Parcak, who estimates that only one percent of the world’s archaeological sites have been identified, let alone explored and studied. “If we don’t go and find these sites, looters will.” If you’ve seen the show (or have had a mining claim) you know that this pearl of advice is heinously true. 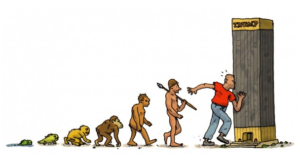 Parcak hopes GlobalXplorer will help catalyze a modern age of discovery and preservation – one that could give hope and perspective in “these challenging times.” Hmmm. 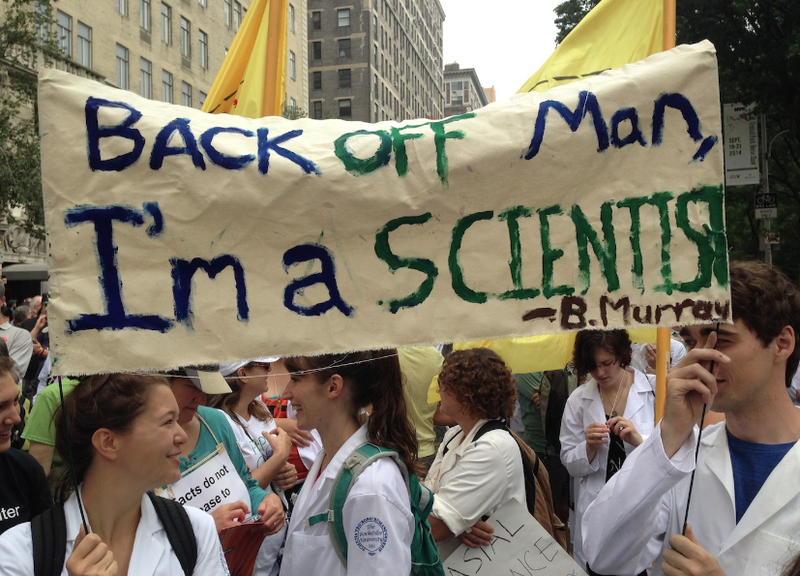 Do ya think this bold scientist is referring to the war on science fobbed on our souls daily by the Great Orange Cheeto could have something to do with her sentiments? 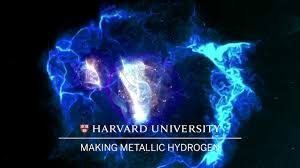 After nearly a century of failed attempts, a couple of scientists from Harvard have finally created “metallic hydrogen,” something that could revolutionize space travel. 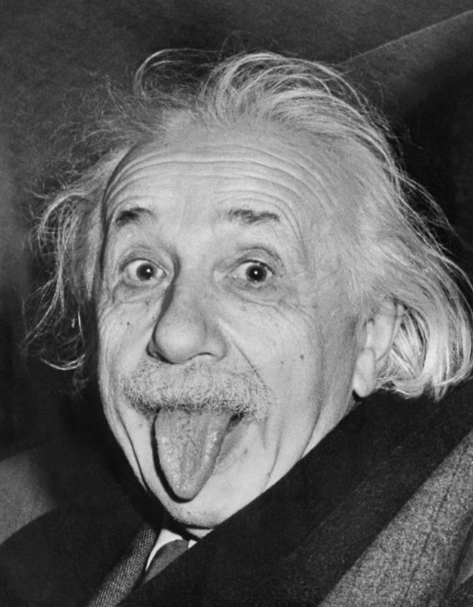 The advent of metallic hydrogen was predicted 80 years ago by physicists Eugene Wigner and Hillard Bell Huntington, but trying to create the stuff in the lab proved harder than Donald Trump’s super-dense and insulated skull. Harder, even, than diamonds. So Alex Silvera and his cohort Ranga Dias created “tiny anvils” made of lab-created ultra-pure diamond dust that could withstand atmospheric pressure 246,000 times what we know as normal. Phew! 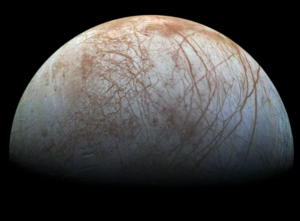 Pressures like that are only found in the cores of dense planets (like Jupiter -see left). Not even Earth has a core as dense as that. This new material can be used to make better magnetic-levitated trains and MRI machines in hospitals, but its most hopeful use could be used to propel us into the cosmos. San Francisco-based Uber Technologies, a leader of the shared car ride service, just hired NASA scientist Mark Moore of NASA Langley Research Center in Virginia to help them develop a flying car. It doesn’t mean we’ll see Jetson-like pods buzzing around the sky anytime soon – the concept from draft-board to helipad is decades off – but it’s a start being applauded by techies, especially those in the road car-clogged Silicon Valley. Just last week, Space X boss and Tesla electric car king Elon Musk announced he’s ready to tunnel underground to get away from the maddening crowd. 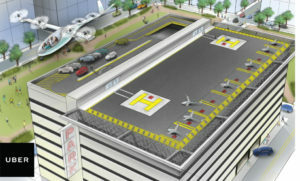 Flying-car ports could be installed on high-rise rooftops, as they are now for helicopters, and the idea of landing in the middle of freeway cloverleafs is being spit-balled as well. Right now, it takes some two hours to get from the San Francisco Marina to downtown San Jose. 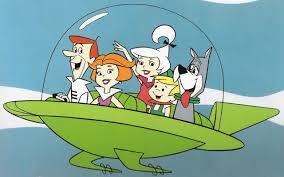 Uber says their future flying car could do it in 15 minutes. If it ever does happen we will indeed have Uber uber alles! I know how you are feeling at this point. It’s like, “Why march? What’s the damn use?” Personally, I just want to put on an old movie from the 1940s and see how art used to be done. Just leave me alone. The problem is that you won’t be merely left alone. You, your family and friends, and everyone on this globe will be affected by the greedy, meat-tossing decisions made by the Cheeto-in-Chief and his Sith overlords. I honestly wish I could be writing about something other than what the Trump Cabal is doing to the world’s air and water and diverse species, but since our very lives depend on this, I am stuck with delivering this gut-wrenching news to you. But first, a sliver of hope. Yes. Trump is filling in the slots of the judges who will decide such appeals. And Pruitt, as we have mentioned here before, has sued the EPA 19 times. How’s THAT for hope and nihilism?? 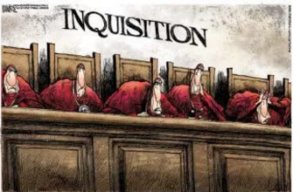 So this is what we have to push against, and the frat boys from Krappa Delta Trump are doing their best to send us back to the intellectual dark ages by gonad-grabbing the Constitution, flatuating on decades of scientific research, and turning the US into one big fossil-fuel keg party. 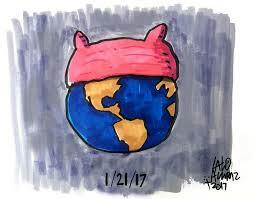 Don your pink-colored, knitted brain hats and ferret out your Granddad’s pocket protector – April 22nd has been chosen as the first-ever March for Science in which thousands of brainiacs will exchange their lab coats for placards and take to the streets in Washington DC as well as other cities around the globe to rally on behalf of “publicly-funded, openly-communicated, evidence-based research,” according to the Washington Post. 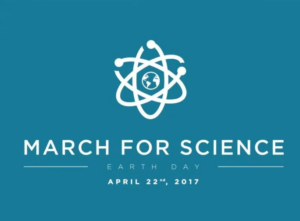 The DC event (which is being held on this year’s Earth Day) will cap off with a rally on the Mall featuring speakers and scientific “teach-in” tents. 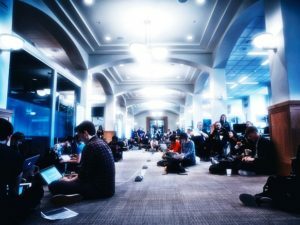 Organizers say that more than 40,000 people have signed up online to volunteer for the event, which since its inception just two weeks ago has garnered over 800,000 followers on Facebook. As of last weekend, other cities planning satellite marches include San Francisco, Los Angeles, Denver, Portland, Louisville, Oklahoma City and Miami. Just look back 1,000 years ago at the Middle East, where math and science flourished in Baghdad. Algebra and algorithms were invented in the Middle East. So were Arabic numerals — the numbers we still use today. But when a new cleric emerged during the 12th century, he declared math and science to be earthly pursuits, Tyson said, and good Muslims should be concerned about spiritual affairs. The scientists drifted away, and scientific literacy faded from that part of the world. 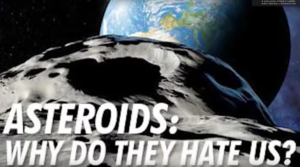 This planet just dodged another bullet: an asteroid the “size of a bus” grazed our upper atmosphere last Wednesday afternoon at about 3:25 PM Eastern Standard Time. And it was close enough to slide between our Moon and the exosphere. Gee, it’s a good thing we have so many scientific brains working on the detection and deflection of these cosmic wrecking balls. Dream on! The number of asteroid/astronomer scientists working on this planetary danger is, as the science community reminds the world continually, akin to the amount of “middle-class” multi-employed humans working in one McDonald’s fast-crap restaurant. We wish we were being hyperbolic in this fact, but it is the unvarnished truth. Back at SpaceX’s test facility in McGregor, Texas, the first mission to fly a previously-used first stage rocket came a step closer to reality with the successful firing of a recycled Falcon-9 booster in late January. The 15-story candle, which was launched originally in April 2016 (and was the first to safely land at sea atop a floating barge) is slated to loft 10 communications satellites this March. 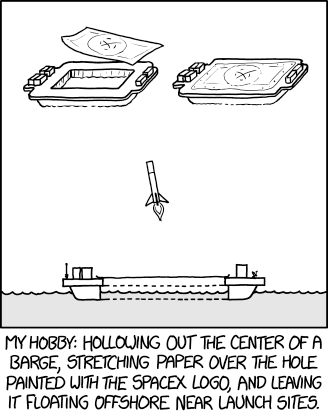 Many thanks to Randall Munroe, xkcd. This false color view of Jupiter’s polar haze was rendered by “citizen scientist” Gerald Eichstädt using data from the Juno spacecraft’s JunoCam. Holy Punxsutawney Phil, Batman! 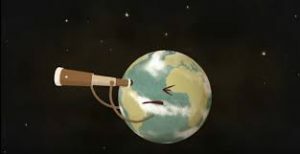 While us Earthlings last week were divining the sunning habits of a North American rodent to predict the weather, NASA’s Juno spacecraft was skimming 2,670 miles above the tops of Jupiter’s clouds while gathering new data that hopefully will unlock the mysteries of the gas giant’s tempestuous atmosphere “It’s never Groundhog Day when you are flying past Jupiter,” said Scott Bolton, principal investigator of Juno from the Southwest Research Institute in San Antonio. “With every close flyby we are finding something new.” Revelations from previous Juno close encounters include eyebrow-raising discoveries such as the Jovian magnetic fields and aurora are bigger and more powerful than originally thought and that Jupiter’s cloud belts extend deep into the planet’s interior. Juno’s current 53-day orbit will bring it back in spitting distance to the gas giant on March 27th. NASA has made public the results of its “Kelly astronaut twin study,” and it is all too clear just how detrimental space travel can be on the human body. In fact, it seems to be way worse than physiologists predicted. 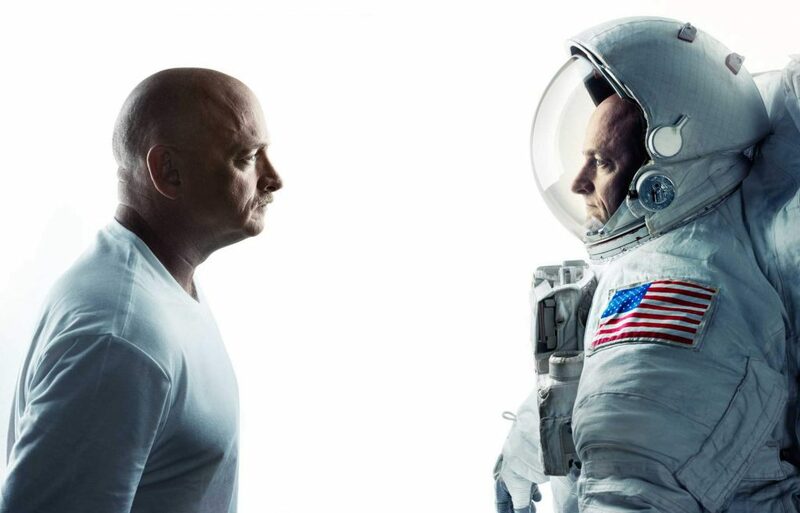 As many readers know, NASA sent astronaut Scott Kelly up to the International Space Station in March of 2015, where he spent 340 days on board the claustrophobic free-floater platform – with other cosmonauts and astronauts coming and going freely every two weeks. Meanwhile, Scott’s brother, Mark – a retired NASA astronaut – stayed put on terra firma. This gave NASA a well controlled built-in experiment, since identical twins are exact genetic copies of each other. Scott came back to Earth, the prodding and examining started, and the results were recorded. Most reports explain the upshot in clouded, smoothed out terms that are utterly confounding. Strained vocabularies, like the word-salad “altered gene expression,” are used in an overly ginger fashion. Science Alert is one source we found that didn’t mince words: “[T]he effects are the total opposite of what scientists were expecting.” Naturally, one would predict that space radiation would be hideously bad, worse than what we thought we could bare, say, on a trip to Mars. But Science Alert (as far as we can tell, the only rag to simply state the results in normal and clear terms) explains that Scott’s “telomeres” lengthened. Telomeres are the protective “tails” on the ends of chromosomes that protect cells from the evils of radiation and other toxins. It’s a good thing, and apparently, these telomeres do not normally grow by themselves under Earth-like conditions. It means that the human anatomy may be able to compensate Darwinian-style for the hell that the Universe – or rabid lawgivers – chuck at us! According to a new study published in the latest edition of the journal Nature Astronomy, our Milky Way and its Local Group of galaxies are in the middle of a cosmic tug of war between a couple of previously-known dense regions of the universe and a newly-discovered “void,” lacking any galaxies. “By 3-d mapping the flow of galaxies through space, we found that our Milky Way galaxy is speeding away from a large, previously unidentified region of low density. Because it repels rather than attracts, we call this region the Dipole Repeller,” study lead author Yehuda Hoffman from the Hebrew University in Jerusalem said in a statement. Astronomers have long believed that our galaxy’s sprint through the cosmos was caused by the gravitational pull wielded by two dense galactic regions of the universe — the Great Attractor that contains a half dozen clusters of galaxies about 150 million light-years from us, and the Shapley Concentration that is populated with over two dozen clusters and is lurking 600 million light-years beyond the Great Attractor. Researchers hope now that this Dipole Repeller has been pinpointed , they will be able to calculate both the direction and the speed of Milky Way’s motion (which is now assumed to be an astounding 1.2 million miles per hour).